I finished this little backpack quilt measuring 36"x42" using the left-overs from my 2014-15 Sat. Sampler quilt. I had the panel that goes with this line of Deb Strain's Bloomin' Fresh fabrics so I just squared them up and alternated them with polka-dotted blocks. I'm hoping this quilty hug finds its way to a preteen/teen in need through the Little Lambs Foundation for Kids. I think my flowered backing and Daisy on a String Pantograph finished this one off nicely. Spring is sure slow coming this year, but it's nice to see the Plum trees finally blooming and the grass getting green with all the rainy days we have been having. 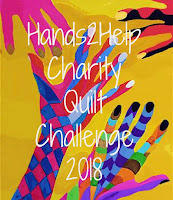 So this is my fourth stash-busting finish this year and te first of two charity quilts that I'm creating as part of Sara's H2H Charity Drive. Oh! and come to think of it, I'm half way to my April OMG goal. Sweet! I have to admit it feels good to have such productive time in my sewing studio this year. Super cute, so relieved it got the Jackson seal of approval. Whew! Congrats on a bright and cute quilt. It would be perfect for a tween or teen. What a beautiful little quilt!! Whoop whoop!! That's a darling quilt for Little Lambs. Super fun! And that backing fabric looks great with it! I'm sure it will find its way to someone who will love it! What a sweet picture of Jackson on the quilt!! A beautiful quilt, and perfect for a teenager! This is such a fun, cheerful quilt. I really like the backing fabric. Spring came all at once here! Bright and cheerful. And Jackson is a cutie, too.